Glen Kyle, executive director of the Northeast Georgia History Center and instructor for "Museum Practices in Appalachia," a new course offered this semester at UNG for students who want to learn more about working for a museum, historical site, or national monument. For history students who are considering a career in the field of museums or public history, the University of North Georgia (UNG) now has a survey course covering many aspects of that type of work. Spring 2018 semester, explores the theory and practice of public history and role of history-centric interpretive sites in Appalachian communities. It teaches fundamental, practical approaches to professional development, with emphasis given to history museums, historical sites and structures and public interpretation of southern Appalachia. "The No. 1 request we get from students minoring in Appalachian Studies is a museum studies class, as they hope to work at a historic site or national park," said Rosann Kent, director of UNG's Appalachian Studies Center. "This is the first class specifically designed to meet the need of those who want to work in the region." Rather than being taught in a traditional classroom setting, classes meet once a week at the Northeast Georgia History Center in Gainesville, Georgia, under the instruction of Glen Kyle, a part-time faculty member at UNG and the center's executive director. "Some of the students who major in history don't always go on to teach," Kyle said. "This class is to better prepare marketing yourself to these particular venues. Students in this course get a taste of every aspect of working in an institution that focuses on public history." Kyle said students learn the fundamentals of putting together an exhibit, museum education, marketing, fundraising, educational programming, and resource allocation. Working hands-on gives students insight as to what awaits them should they pursue a position in this type of work. The goal is for students to progress through the class and step into a basic job in a museum in the end. "A lot of them don't know how to hang a picture properly, or where to begin when planning an exhibit," Kyle said. "They also learn that working in many of these museums or historical sites means wearing a lot of hats." For example, museum employees participate in hosting guided tours, working the welcome desk, cleaning restrooms, updating the museum's website, and setting up for fundraising events. Kyle said the starting pay at a museum such as the center can be low, and the hours are long. Students are required to visit at least two museums for the purpose of critical analysis and observation, and then present their findings in class along with a written report. In addition, students will create a portfolio exhibiting their mastery of the basic concepts of museum work that could include designing an entire exhibit or a development plan for a new or rebranded small museum. Kyle tells the students about his own journey in museum career. 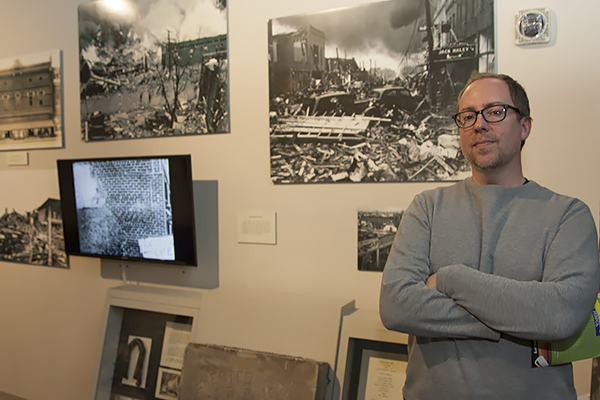 He started out as an exhibits technician at the Atlanta History Center, working his way up to exhibit manager and finally curator of military history. He was later hired as executive director of the Northeast Georgia History Center in 2007. "I've told the students here to take a basic theater technician class, building sets and scenery, working with hand and power tools," Kyle said. "One of the reasons I was hired at the Atlanta History Museum was I had a full knowledge of using power tools from working with my dad in construction jobs. In this job, you can never learn enough."